ListShield™ is an all-natural, non-chemical antimicrobial preparation for controlling the foodborne bacterial pathogen Listeria monocytogenes. 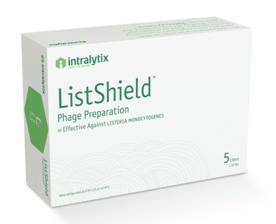 The active ingredients of ListShield™ are naturally occurring bacteriophages that selectively and specifically kill L. monocytogenes. ListShield™ is specifically designed for treating foods that are high risk for L. monocytogenes contamination. It can also be used to eliminate or significantly reduce the levels of L. monocytogenes on non-food contact equipment, surfaces, etc. in food processing plants and other food establishments. ListShield™ is ideal for use in HACCP programs that have identified L. monocytogenes control as a potential problem. ListShield™ received a "Best of What's New" award in 2006 from Popular Science magazine. Complies with FDA food additive regulations, for direct application to meat and poultry products that meet the ready-to-eat definition (21 CFR § 172.785). Is FSIS-listed as safe and suitable for use as processing aid with no labeling requirements when applied to various ready-to-eat meat and poultry products (FSIS Directive 7120.1). Is GRAS for direct application to fish and shellfish (including smoked varieties; e.g., smoked salmon), fresh and processed fruits, fresh and processed vegetables, and dairy products (including cheese) (GRN No. 528). Is Health Canada approved for use on ready-to-eat meat and poultry, smoked salmon, fresh-cutapples, and long leaf lettuce (iLONO). Is National Food Service of Israel approved as a food processing aid for the treatment of ready-to-eat meat and poultry products (Ref: 70275202). Is certified both Kosher and Halal.